September 24, 2006 - 12 noon to 7 pm. This very colorful event, sponsored by Sister Cities of Los Angeles Association and organized by Carolyn Ramsay and Jocelyn Herve, with entertainment throughout the day by the many sister cities, was a great way to promote appreciation, openness and respect for and among the many cultures of the world. 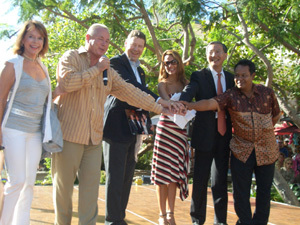 Hundreds of visitors flocked to the stage to see and admire the international performances and to hear and cheer Councilman Tom LaBonge who, in addition to being Master of Ceremonies, also turned out to be a great entertainer and singer. 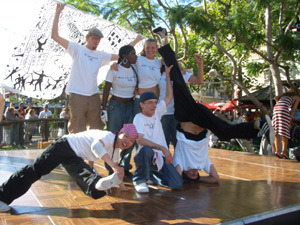 Eight smashing breakdancers came from Berlin conveying the multi-cultural character of our sister city. It was truly a day of music and fun and a celebration and acknowledgment of the People to People From Around the World message.